Hearts is a card game where scoring the least amount of points makes you the winner. Making sure that you are familiar with the different strategies in Hearts is essential to your success. Compared to other trick-taking card games, Hearts is not that difficult to play. Whether you decide to play in a competitive way, online, or simply for fun with your friends and family, winning always feels great. That’s why we decided to give you a list full of examples on how to win at Hearts more often. Not all Spades are created equal. High spades are dangerous, while low Spades act as a cushion, guarding you against the Queen of Spades. That’s why the more low Spades you have in your hand, the better. If you were to be passed the Queen of Spades bare, you’d be forced to play it as soon as Spades are led by another player. As you know, the rules of Hearts state that whoever holds the 2 of Clubs leads the hand every single time. The reason you wouldn’t want to be in this position is simple. On the first hand, cards that give points can’t be played. This is the perfect moment for you to clear a high card of yours. 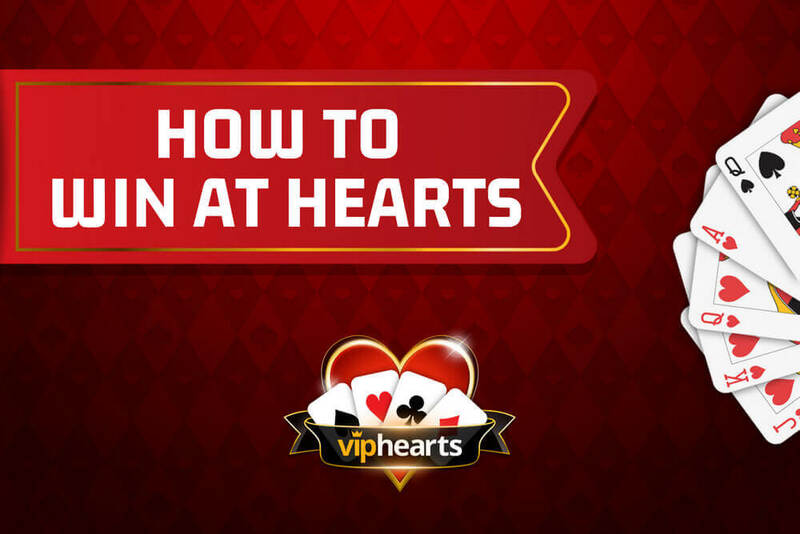 Playing a high Club early on gives you some freedom, as well as the potential chance to lead the next hand if you were to win the first one. If you don’t have the 2 of Clubs, get rid of any high card that might win you a trick later on. After the first round, it might be argued that you are still safe to clear your high cards in the second or even third round. Players would be trying to create voids and this would be the perfect opportunity for you to jump in and win some hands worth 0 points. One of the most common styles of play in Hearts is creating a void of a suit at the beginning of the game. If you happen to have a suit in which you only have one or two cards, lead with it. There is no “most appropriate suit to create a void in”, but I’ll give you an example that has saved me more times than I can count. Imagine that you are holding the Ace and King of Spades in your hand. At the same time, you only have the 3 and 4 of Diamonds. Clearing them out early on ensures that hopefully, you might be allowed to dump those high spades in an off-suit trick. Whatever helps us NOT to take the Queen of Spades, we must use to our advantage. Whenever a player is dealt a hand with very high ranked cards or a large number of hearts, “Shooting the Moon” becomes a viable choice. Shooting the Moon occurs when a player wins all Hearts and the Queen of Spades, scoring all 26 points. If successful, the player who won all scoring cards gets a score of 0 for the round. At the same time, everyone else receives 26 points. Shooting the Moon is not a common occurrence, as it requires serious preparation and strategy. Being extremely high-risk, high-reward, it is a play that can turn around any game. For this reason, you don’t want to be on the losing end of it. A simple solution exists for stopping anyone who dares to attempt shooting the moon. In a best-case scenario, having the Ace of Hearts is all you need. This particular card has the power to make or break a “Moon Shot”. That’s why even if it is your only Heart, you should never pass it. In a worst case scenario, you’re going to score a few points when you play the Ace of Hearts. Looking at the big picture, scoring 2 or 3 points is a lot more desirable than 26. If you pay attention, you might get a good idea of what the strategy of your opponent is, depending on the cards passed to you. With just a glimpse, you can suddenly gain an advantage over your opponents simply by taking in some information and thinking ahead. Being proactive, rather than reactive, should always be your main goal. To further gain more knowledge on how to become a better player in general, you can read about more advanced strategies in Hearts.